Welcome back to First Impression Friday! This week, we’re going with something non-fiction, Cry of the Kalahari. All the credit for this one belongs to my boyfriend, Steven. He described it as “these crazy scientists go out to the Kalahari desert by themselves and end up living with the lions and other animals.” He explained that when he first read it as a 10-year-old, it had seemed like just a fun adventure. However, when he re-read it when he was an adult, it was, “These people are insane.” And, after starting this book, I think I’m agreeing with his second impression. Well, that’s not very descriptive, is it? This book is so much more than just a travel diary. It’s real life, and when reading it several times I had to put it down and just think, These guys aren’t that much older than I am. When Delia & Mark met, they were graduate students. They discovered a passion for endangered African animals. This passion culminated in them getting married, auctioning every single thing they owned, and taking the $6,000 they got from that to buy plane tickets to South Africa, where they then settled into the Kalahari Desert (actually, Deception Valley) with no idea of whether they would get research funding or not. You can’t get much bolder than that. So far, the book has been spectacular, and I find myself wishing that my lunch break was just a little longer so I could finish just a little more. I’m expecting this to be a wonderful book. 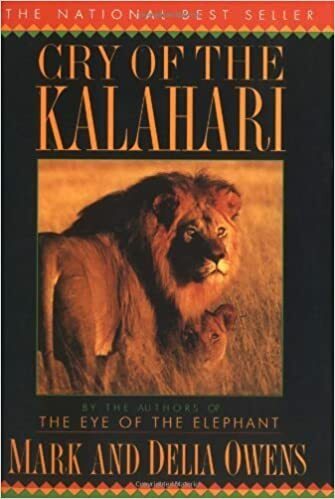 It was published in the early 1980s (the book takes place from 1972-1980), and I’m sure that the Kalahari has deteriorated even more since the Owens started their research. Apparently, Delia just wrote her first novel, and I’m excited to maybe get to that in a bit. Posted on February 1, 2019 January 16, 2019 by Lauren @ BAOTBPosted in First Impression FridaysTagged africa, cry of the kalahari, First Impression Friday, First Impression Fridays, nonfiction.